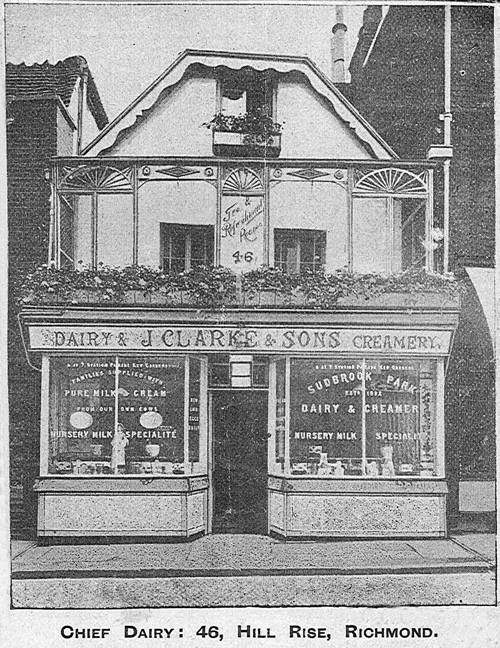 dairy business that had already been established at 14 Upper Hill Street Richmond. 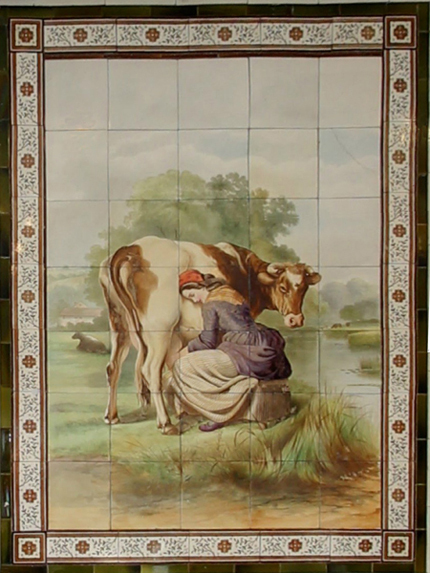 married Lillywhite's daughter Mary Ann. 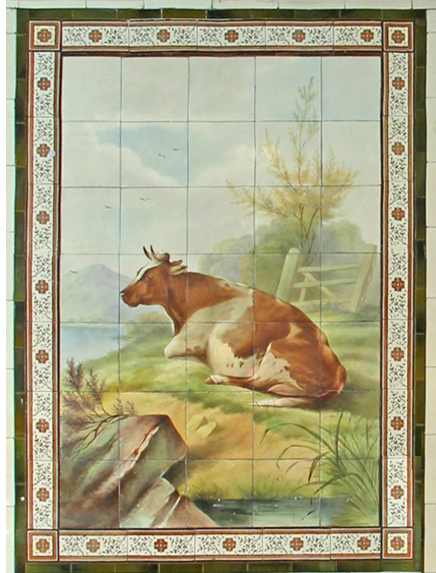 William Lillywhite died in 1874 aged 77.
twenty years raised a dozen children. 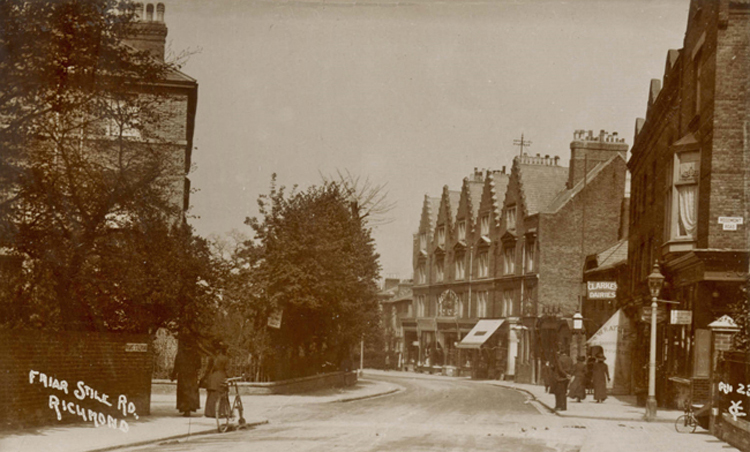 East Twickenham. 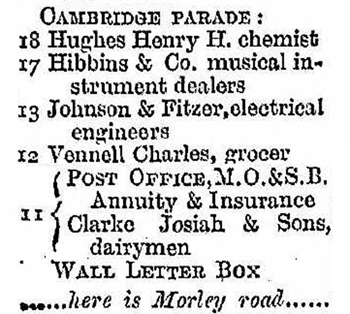 The census below shows the family living above the shop. 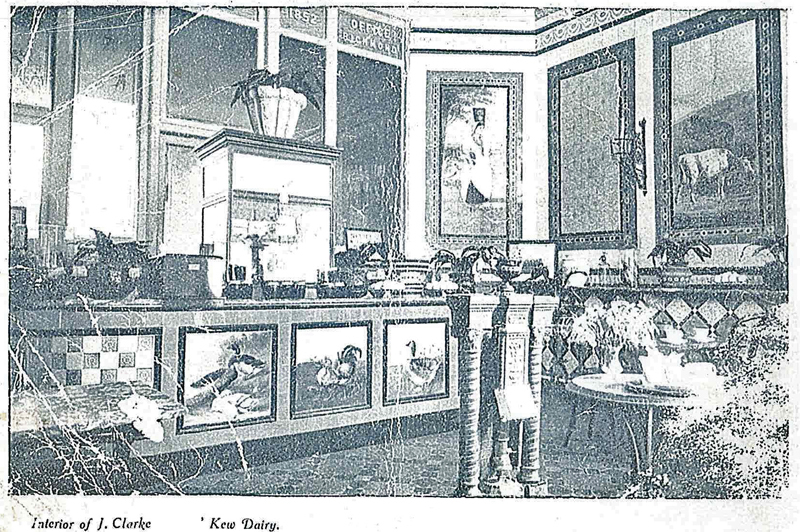 The premises were jointly used as a sub Post Office being staffed by his daughters. 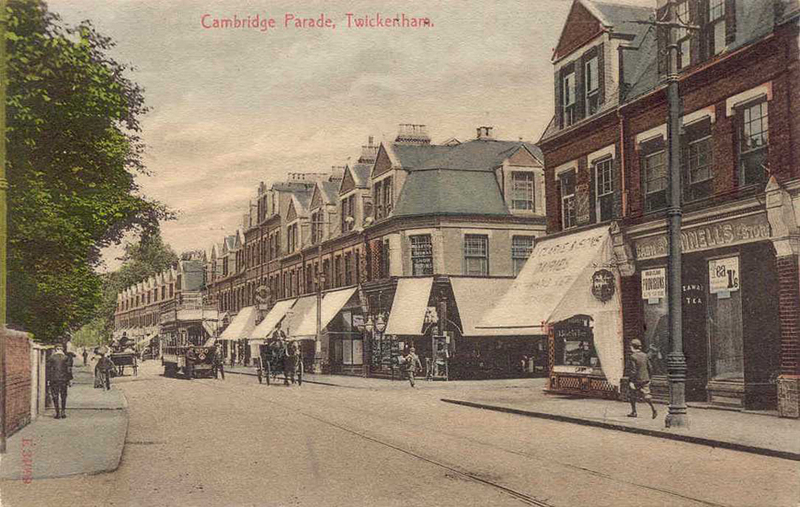 The picture above shows Clarkes Cambridge Parade shop at around this time. 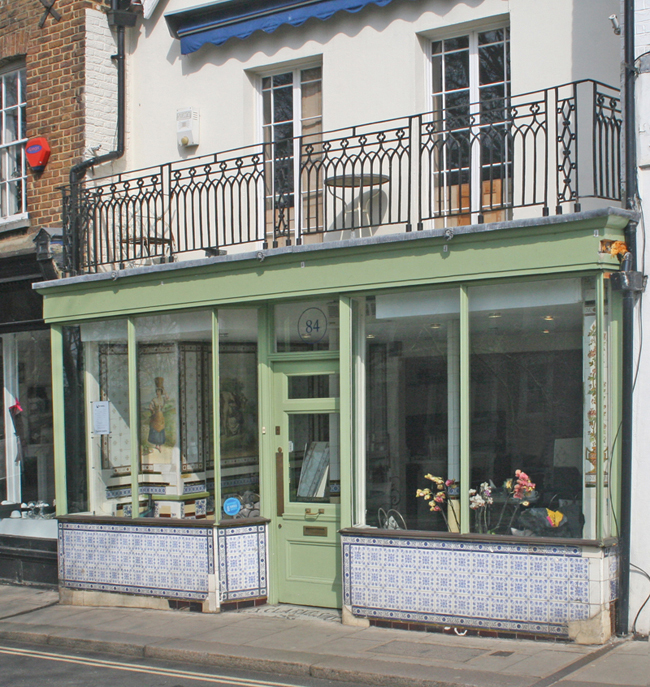 It's the first shop with a white awning next door to Vennell's grocers shop. 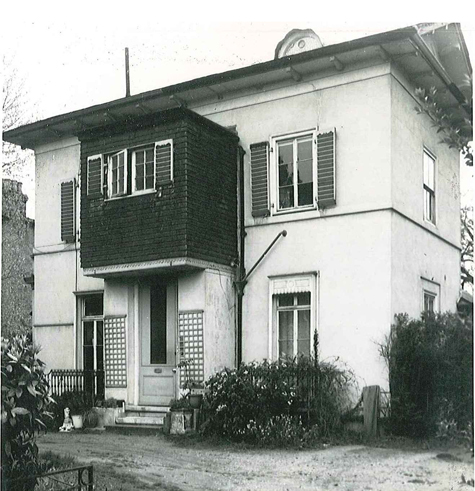 the larger property named Park Lodge also in Park Road. 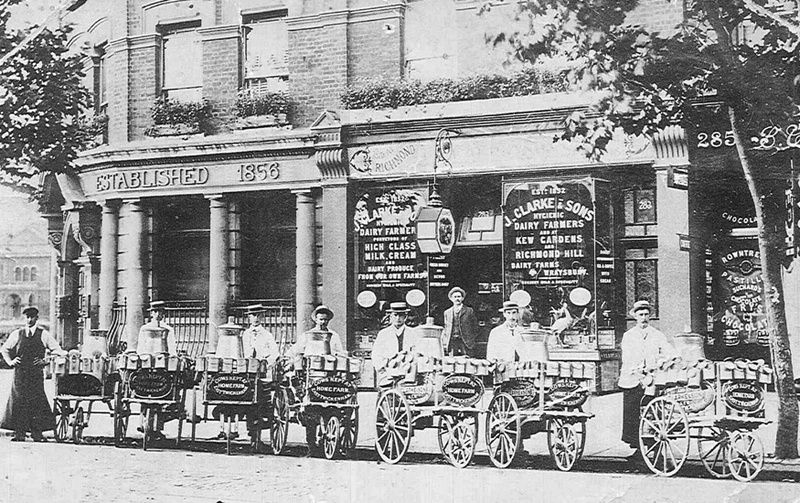 of James Gait the previous owner of the Richmond premises. 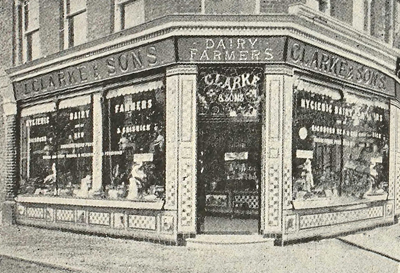 The Clarke's opened their next dairy shop close to Kew Gardens Railway Station. 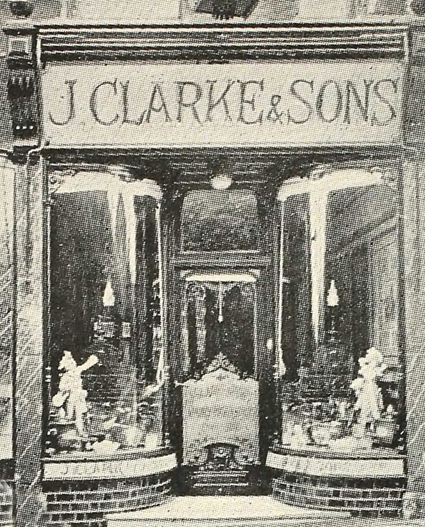 a rival shop at number 16.
shop. 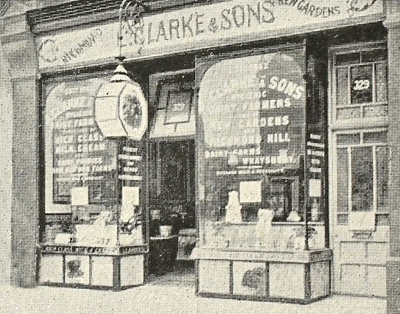 Hornby's shop is now a butchers. 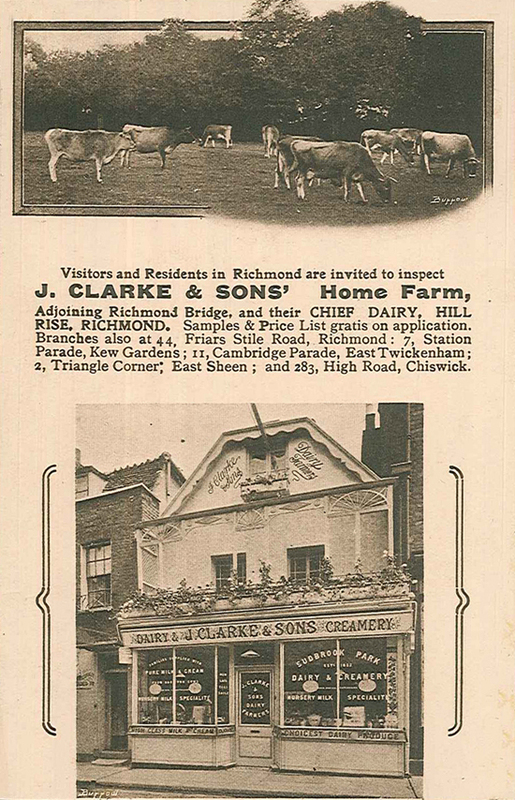 adverts for milk from J Clarke & Sons and F & H E Hornby. at this time. 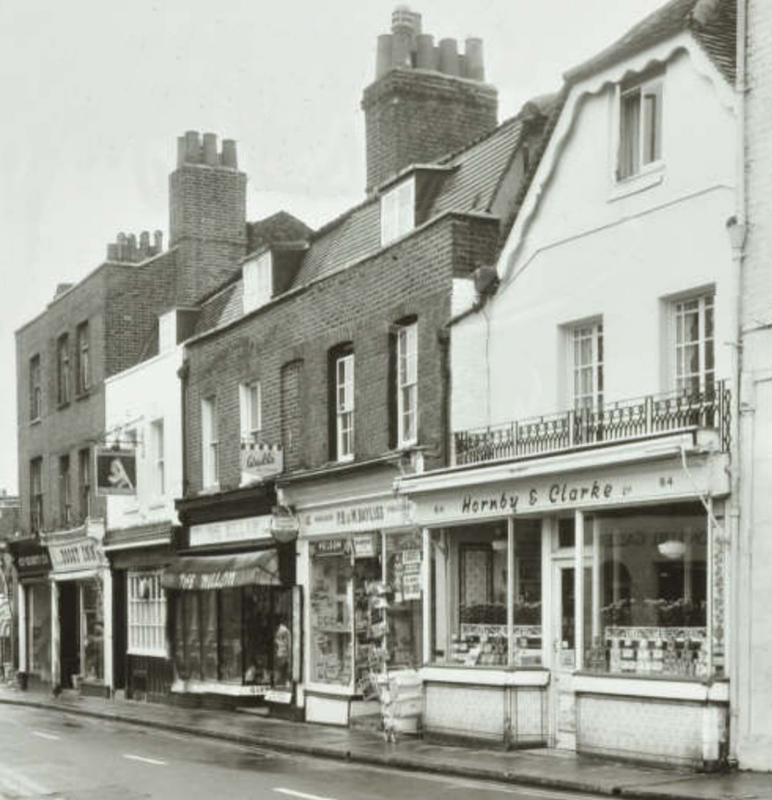 The shop in Richmond Roadis shown below from 1904.Park Lodge is photographed below in the 1970s. 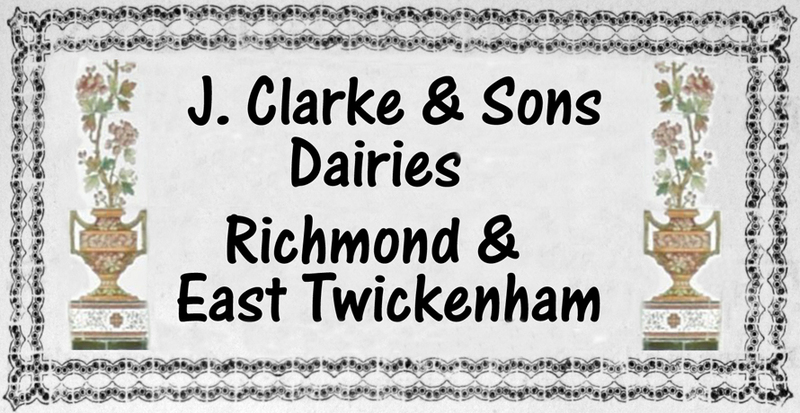 Josiah Clarke's eldest son James Clarke managed the other Richmond dairy shop at 44 Friars Stile Road. 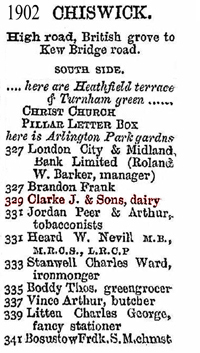 James had married Edth Hannah Tomlinson in 1906 and they ran this branch for a number of years. 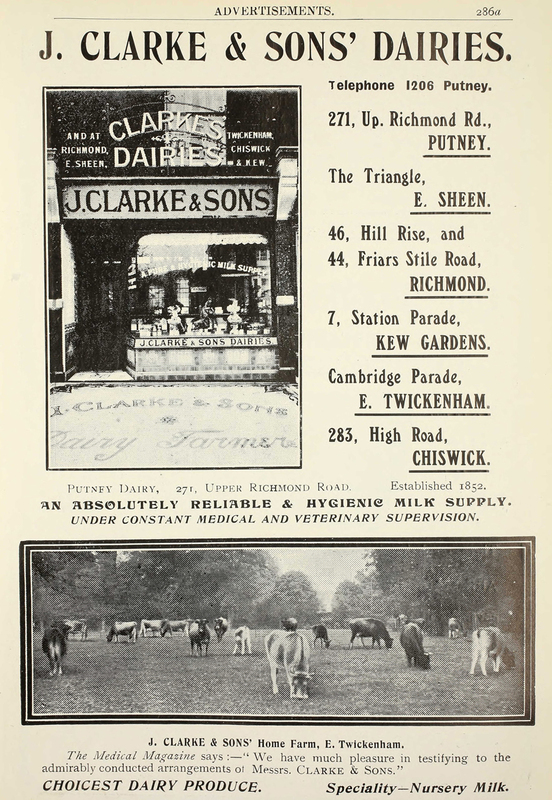 The two Telephone Directory extracts below date from 1906 and 1909.
a Chiswick at 283 High Road. 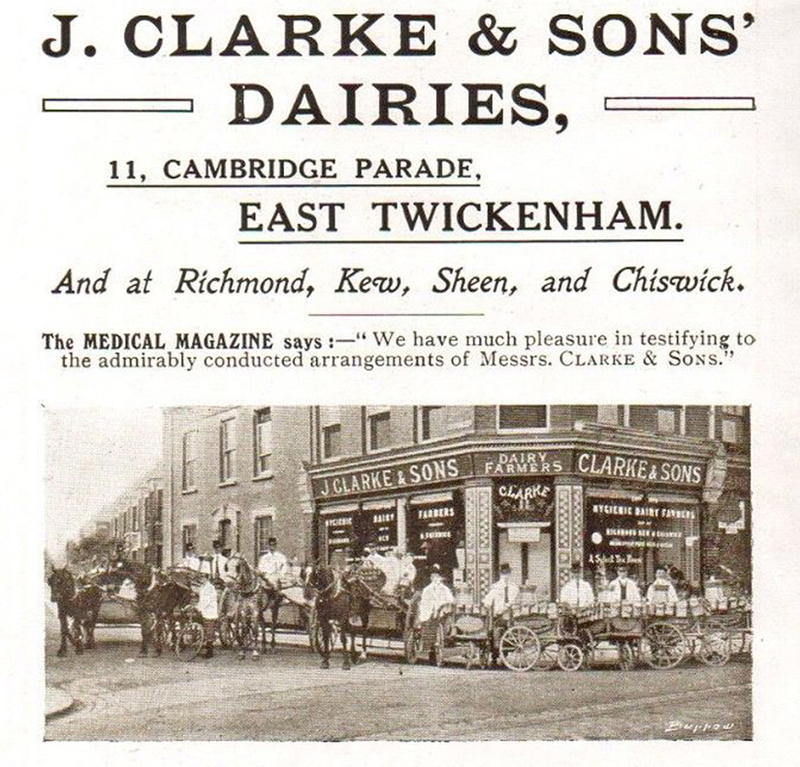 A further shop at 271 Upper Richmond Road had opened by 1909.
manage the 380 Richmond Road East Twickenham branch but moved home to 97 East Sheen Ave Mortlake. 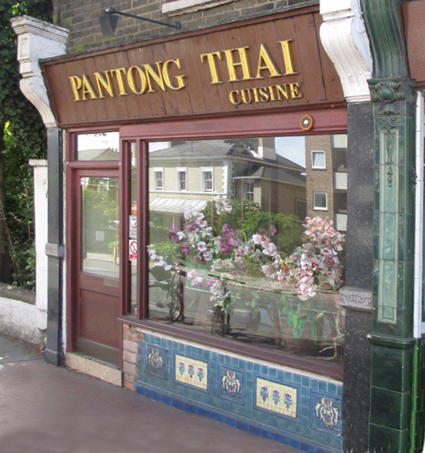 at a later date to a Thai Restaurant. 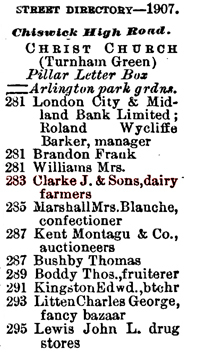 This branch was originally operated by Josiah Clarke's son Ernest Baldwin Clarke and his wife Mary. 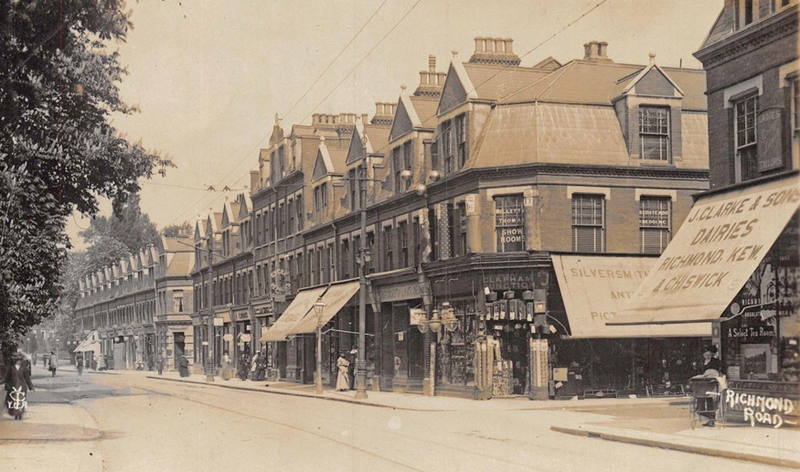 These historic photos show the Chiswick shop shortly after it opened. 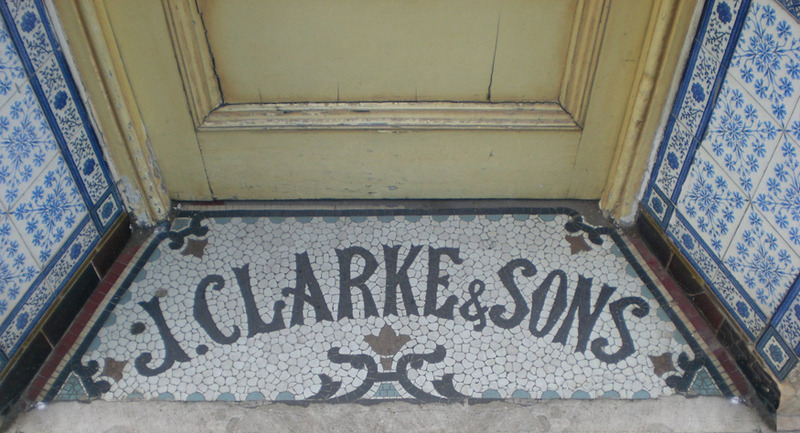 The Bank next door has since been expanded into Clarke's former shop. 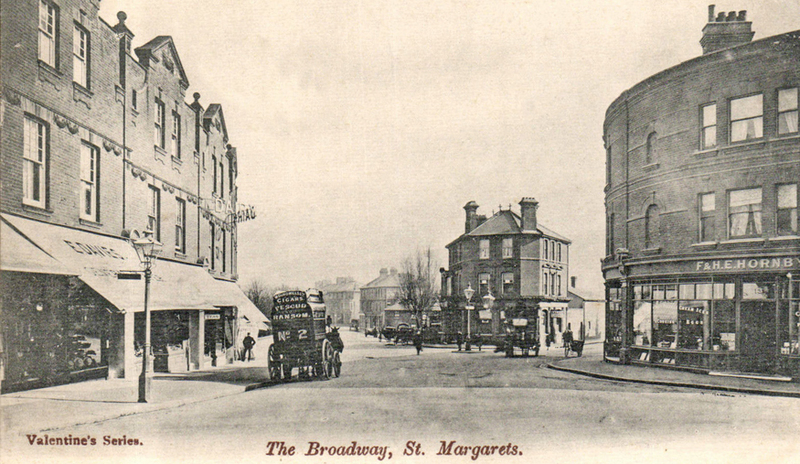 283 High Road by 1907. 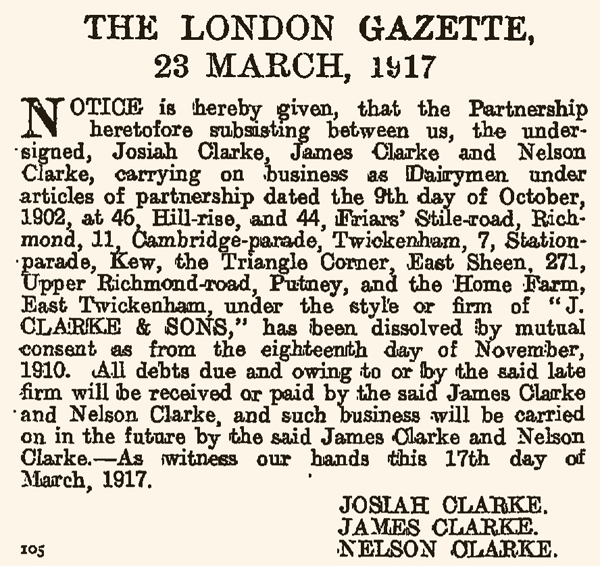 The Chiswick Branch was one of the first shops to open and was managed by Josiah's son Albert Edward Clarke. 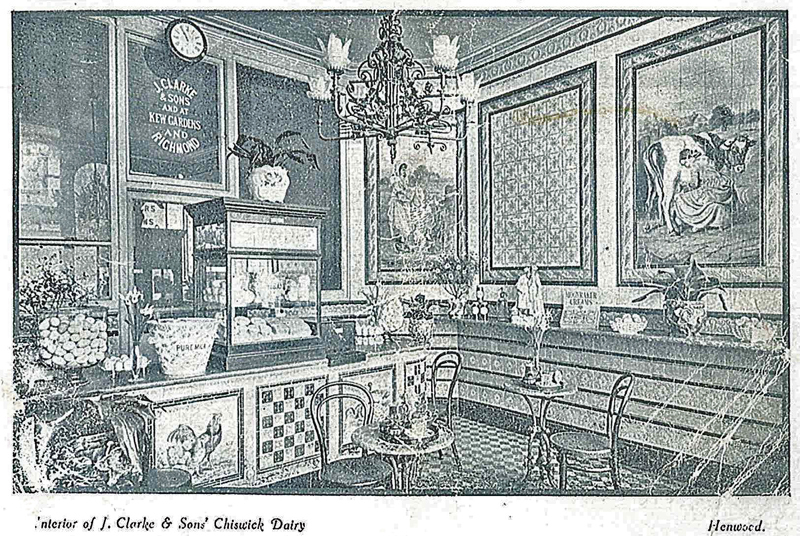 The shop closed around 1914 and eventually became United Dairies . 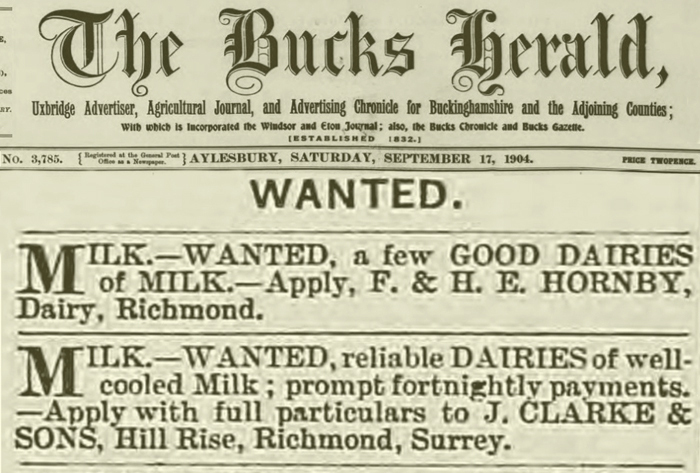 Albert Clarke moved to Beacon Hill Dairy Hindhead Surrey. 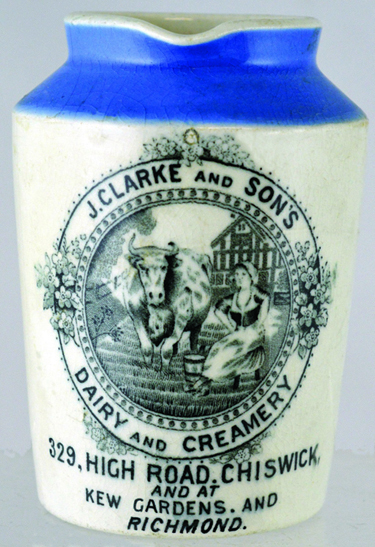 although its number in the road changed to 84.
in all J Clarke and Sons shops. 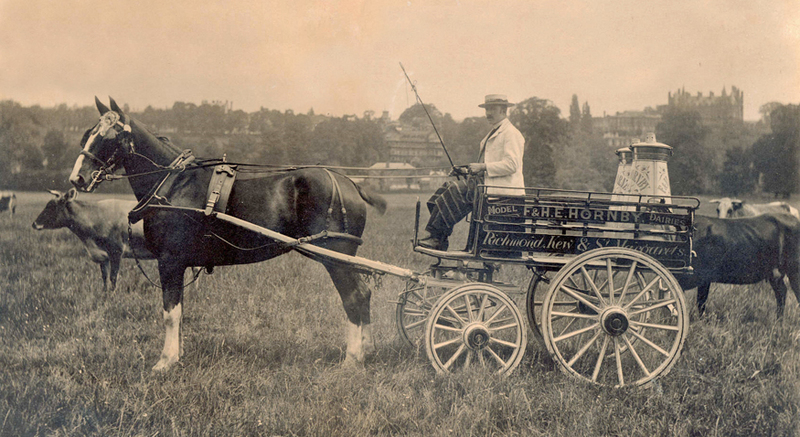 then amalgamated with their main rival F & H E Hornby. 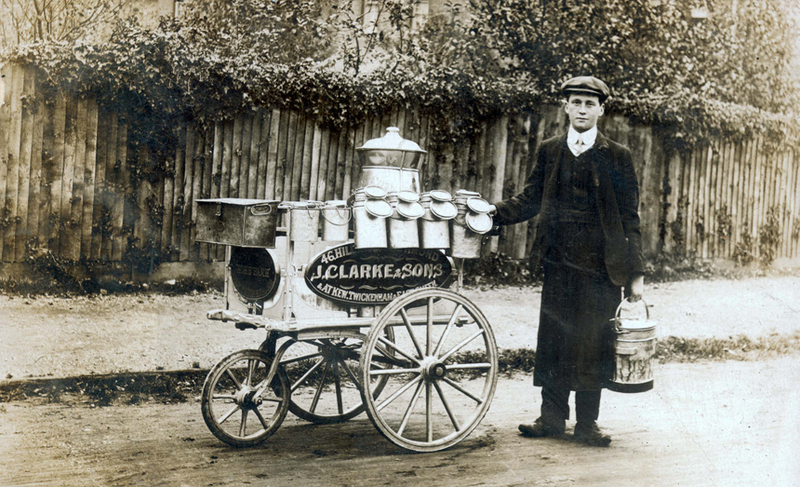 The new company became Hornby Clarke Ltd.
One of F & H E Hornby's milk delivery wagons. 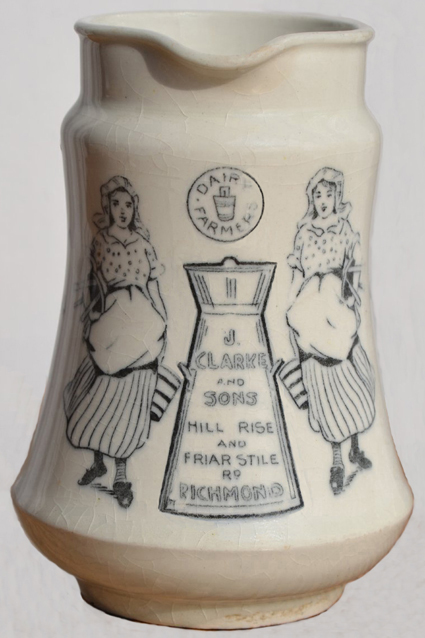 they produced cream retailed in stoneware jars which are very collectable these days. 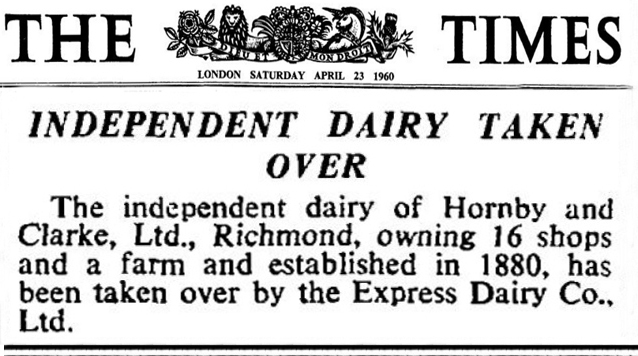 both dairy farmers.The business in the Richmond area was established by Henry. 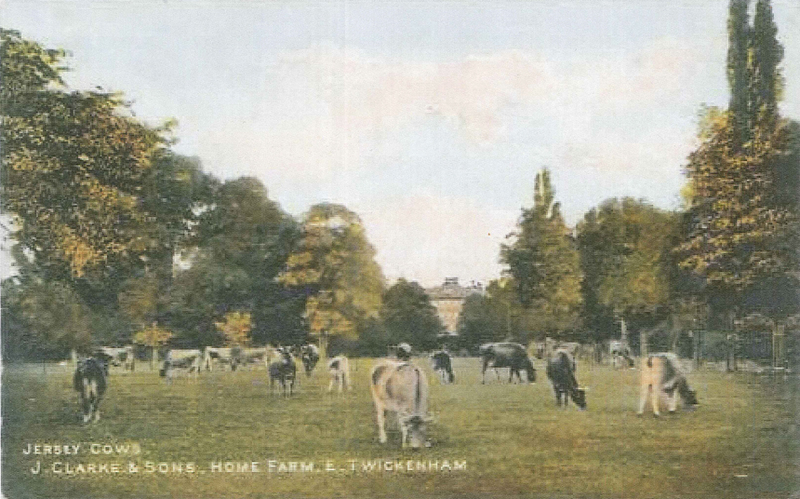 Frederick managed a farm near Bournemouth. 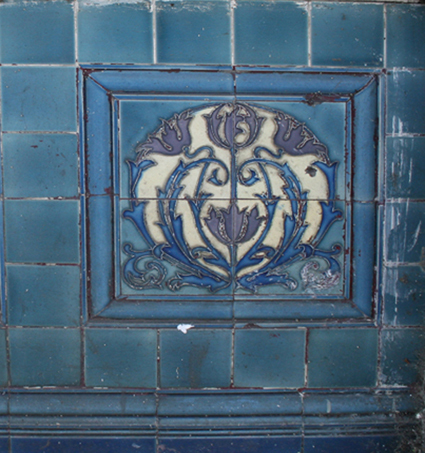 is now a general store. 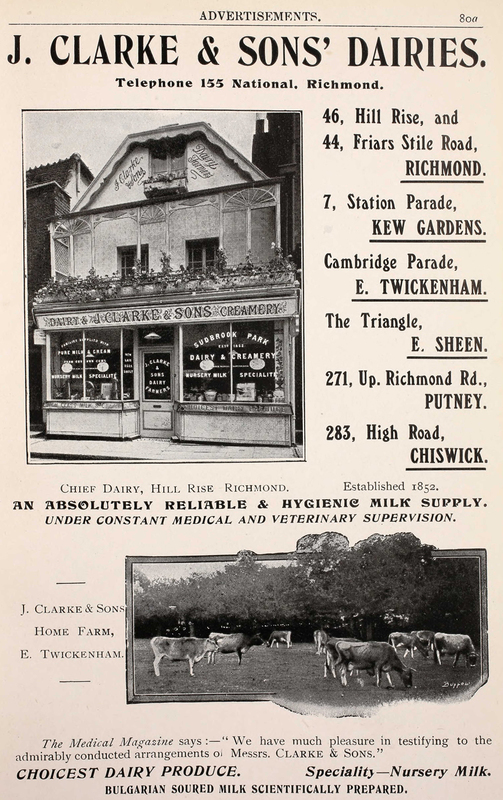 The dairy sign on the left was above the Crown Dairy shop. 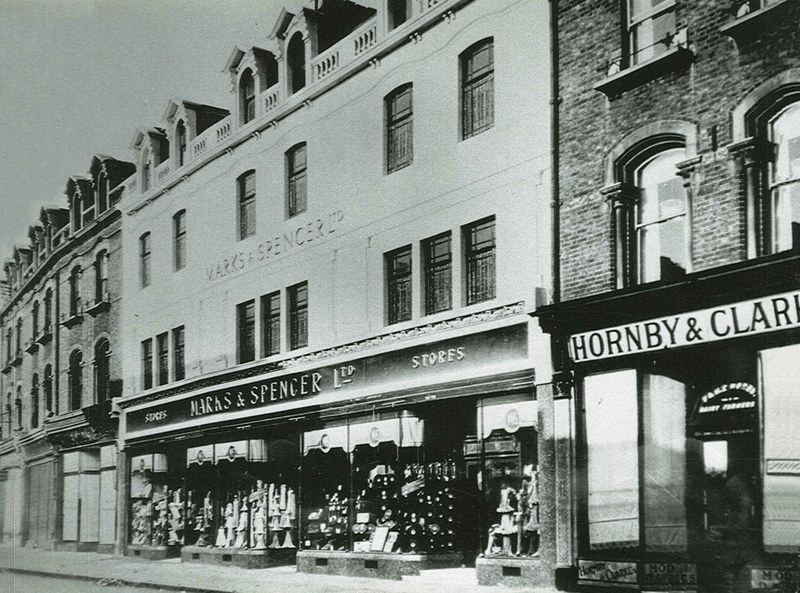 shop was managed by Hornby & Clarke Ltd.
Marks & Spencers shop which has subsequently also closed. 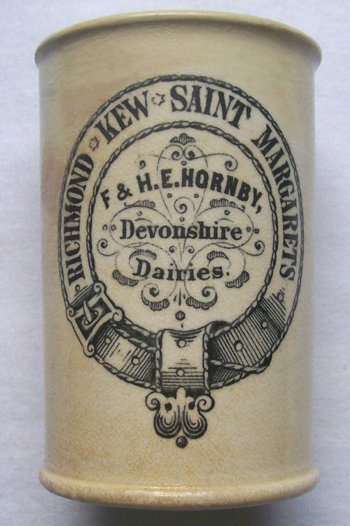 A 1940's period letterhead is shown below. 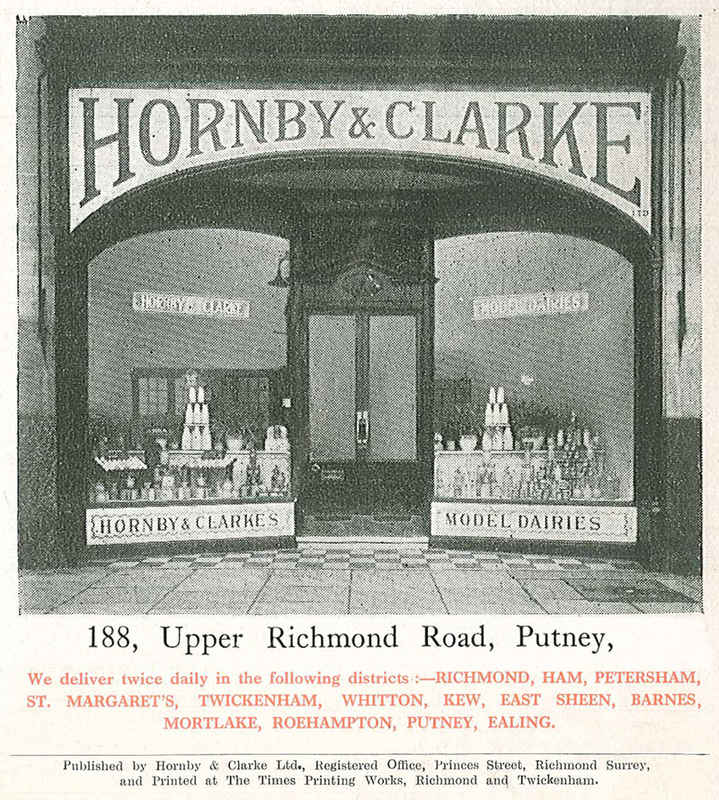 Hornby & Clarke's Richmond shop at 84 Hill Rise in later years. 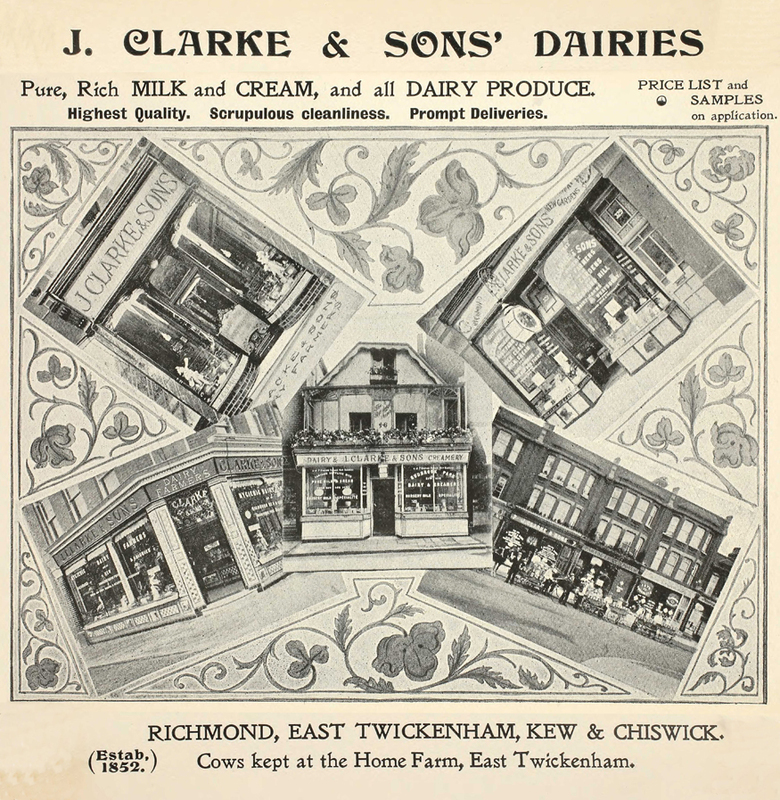 Finally two archive photos of J Clarke's dairy shop at Kew. 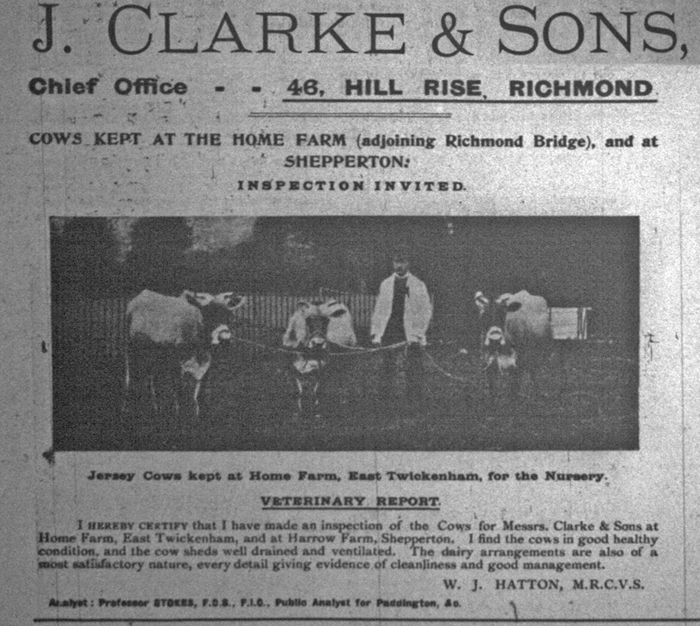 1950's when it operated under the banner of Hornby and Clarke. 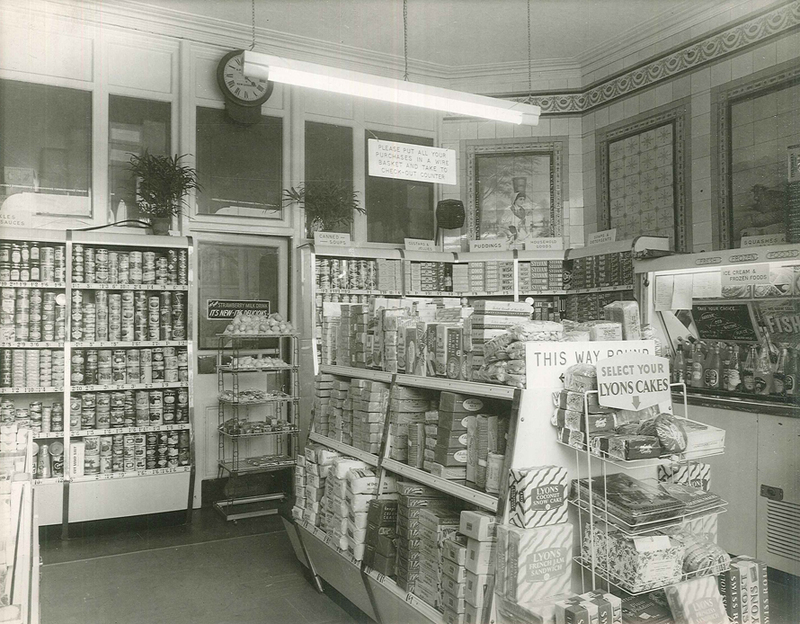 The shop had now become a small convenience store.